The Law of Conversation of Angular Momentum causes very serious problems for the Big Bang Theory. One way to understand the Law of Conversation of Angular Momentum is to illustrate this law of Physics with a practical example. Let us imagine that we have some children playing on a roundabout in a children’s play area. Phase 1: We ask three out of the children to sit on the roundabout and hold tight, and the remaining two children to spin the roundabout. Phase 2: The roundabout is now travelling at 30 mph, and the children pushing the roundabout are beginning to perspire. Phase 4: When the roundabout begins to spin much faster at 100mph, such is the gravitational forces on the children sitting on the roundabout that they all fly off the roundabout. Phase 5: Because of the Law of Conservation of Linear Momentum the children will all fly off the roundabout moving in the same direction as the roundabout. If the roundabout was rotating clockwise, the children will also be rotating clockwise. – In the case of the Big Bang Theory the “singularity” was supposed to have spun very fast, and then exploded in a frictionless environment, which the Universe must have been if all the matter was concentrated at one point. – According to the Law of Conservation of Linear Momentum, all the planets should spin in the same direction. 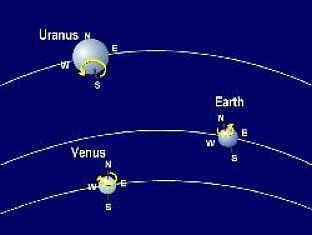 – We know from observation of the planets in our Solar System that the planets Venus, Uranus and possibly Pluto spin in the opposite direction to the other six planets. – In addition to that, there are 63 known moons of the planets. Of these moons, six spin in the opposite direction to the remaining 57. – In our Solar System, three of the planets, Jupiter, Saturn and Neptune, have moons orbiting in both directions. – The above facts are quoted from “Astronomical Almanac for the year 1989″ (Wash. DC U.S. Government Printing Office, 1989) p. E88. 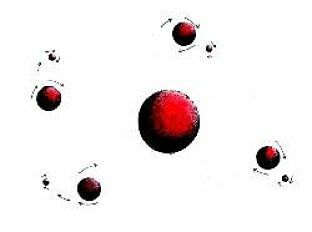 – From the Law of Conservation of Linear Momentum we can see that if our Solar System evolved spontaneously by a Big Bang, all the moons should orbit their planets in the same direction. – The only exception to this would be if they encountered a large mass, such as another planet. – However, this event should certainly have left a crater, which it would have been observed by astronomers. – Observations of our Solar System do NOT support the big Bang Theory. “This (Angular Momentum) would have caused the Sun to spin very rapidly. Actually, our Sun spins very slowly, while the planets move very rapidly around the Sun. In fact, although the Sun has over 99% of the mass of the solar system, it has only 2% of the angular momentum. This pattern is directly opposite to the pattern predicted for the nebular hypothesis.” Quoted from Dr. H. Reeves “The Origin of the Solar System“, in “The Origin of the Solar System”, Dermott, S.F. Ed. John Wiley & Sons, New York p. 9, 1978. “The ultimate origin of the solar system’s angular momentum remains obscure.” Quoted from solar system Evolutionist scientist, Dr. Stuart Ross Taylor, “Solar System Evolution, A New Perspective,” Cambridge University Press, p. 53, 1992, Dr. Stuart Ross Taylor. If the Big Bang Theory were true, the planets would all spin in the same direction, and the matter would be evenly distributed through the Solar System. Instead it is “lumpy”. Throughout the Milky Way there are clusters of stars, then great areas of empty space. This subject is discussed in detail in “Creation Ex Nihilo Dec. 99, p. 8″.